I know that some time back I mentioned to you a television series on Food Network entitled Good Eats hosted by Alton Brown. Yes, I've become a fan of the show. After years of watching some of the amazing little gizmos he has on the show, I decided to bite and pick up a few here. I know what you are thinking... what the hell are those things on my counter? Those are measuring cups. Think about the last time you measured water, milk, sour cream, mayonnaise, peanut butter, sugar, salt, vegetable oil... or about anything else. How many times did you have to rinse out that measuring cup to measure something else? This ingenious item works like a syringe and has measuring markers on the side. 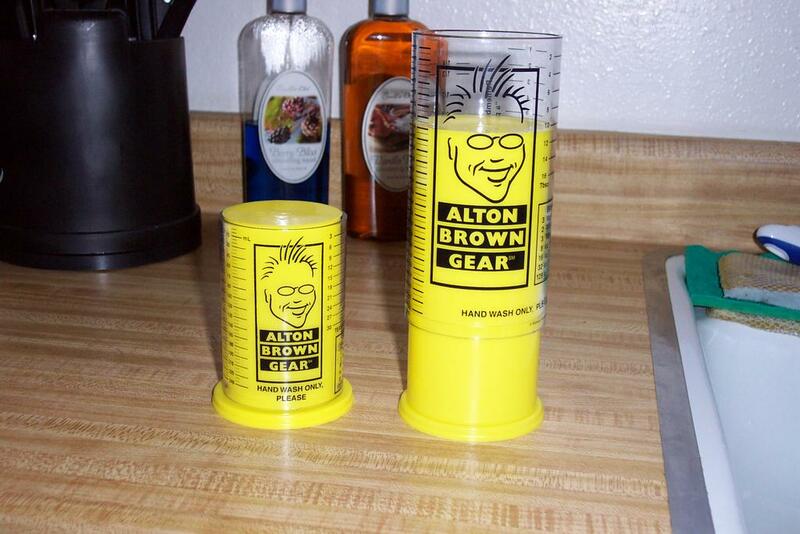 Pull the yellow plunger back to 1 cup and insert item (smoothing out across the top for an exact measurement.) Need to add a 1/2 cup of something else? Pull back another 1/2 cup and add. And when ready to put in a mixer... push it all out. It comes with a smaller version for those of you with little hands. Ok, I'm kidding about that but both do come together. Amazing how simple an idea that was but it took this long to see it out there. Can't wait to see what's next. Way to go Martin, Good Eats rocks. Good Eats has got to be the best cooking show out there as Alton Brown is not only a chef, but also a food scientist and he teaches as he cooks and his shows are the best for learning how to cook as a science and not just following along with a recipe. The measuring cup is really cool, especially when you make peanut butter cookies. I have some adjustable measuring spoons that I love. I may have to get some of these cups. First the shoe basket and now this. What's next Martin? I don't cook. As such, I don't even know if we have measuring cups in the house! That's all badass! Too bad I can't boil water. Just kidding, I can boil water, I just don't like to. OUCH! Losing points there, I know, I know! You fixed my link! You the man. You the man! I'm with Jenn on this one, lol. That's a nifty little contraption, and if I thought I would be spending time in the kitchen to actually cook something, I would snag it up in a heartbeat! That's funny you mentioned boiling water, Jenn. Did I ever tell you the story about how I once blew up a stove trying to boil water? :o) Shew... I'll never try that again! This is sooo cool - The Missus loves this stuff. I'm off to get one now. Hhahaha!! Liv, I wanna hear it!